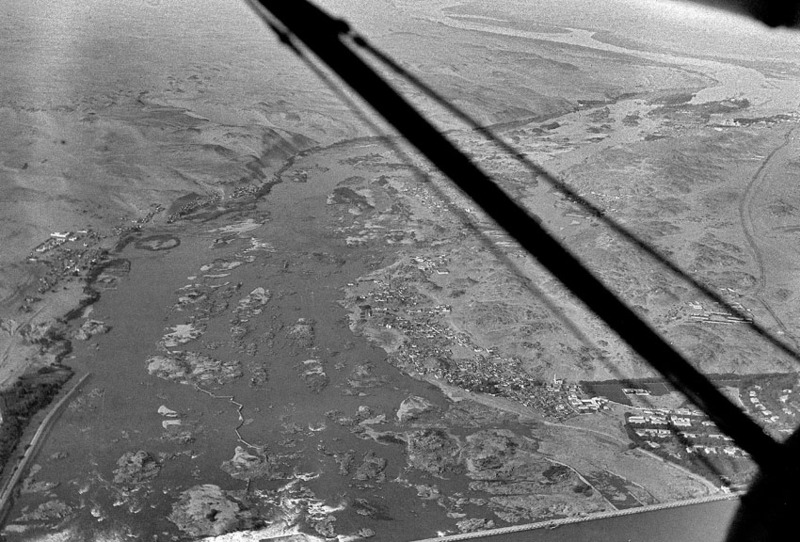 Aerial view of the First Nile Cataract in 1936. The Old Aswan Dam in front, by then tiny Aswan City at top right and the desert at Gharb Aswan to the left. Source: Library of Congress. Image enhanced. Gharb Aswan – or West Aswan – is the home to some 50.000 Nubian peoples on the west bank of the Nile, by the first cataract opposite the city of Aswan. 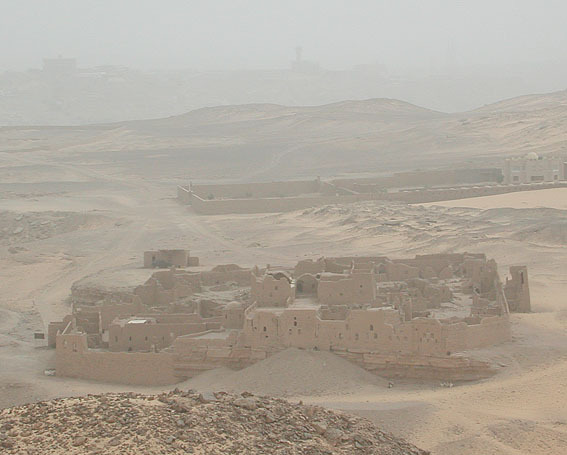 Among archaeologists and tourists the area is renowned for the Tombs of the Nobles at Qubbet el-Hawa and the Coptic St. Simeon’s monastery, both on the UNESCO World Heritage List. But Gharb Aswan is much more than this, for here it is possible to follow human interaction with the landscape for millennia, almost throughout the history of humankind. With a focus on the unique stone working traditions, here’s a synopsis of the “unknown” archaeology of this beautiful desert area – with slideshow, map, bibliography and an overview of missions that have worked here. My first visit to Gharb Aswan was on camel back in 1999. I became fascinated by the beautiful desert landscape and the ancient stone quarries, and thus initiated “The Gebel Gulab and Gebel Tingar Survey” together with Elizabeth Bloxam (project director), Tom Heldal and Adel Kelany. This was back in 2003; the fieldwork soon became part of the QuarryScapes project, which ran until 2008. At the crossroads between Egypt and Nubia, the landscape has traditionally been the archaeological “stepsister” to Pharaonic Elephantine and Aswan. Our survey and the still ongoing Aswan-Kom Ombo Archaeological Project have changed this view, though there is hardly any “monumental” archaeology present: For the landscape is characterised by a truly enourmous range of “invisible” sites – from the Palaeolithic through all of history up to modern times. Stone working was always a major activity in the area, but people lived and hunted here, they buried their deads, worshipped, made rock art and set up thousands of standing stones. And the area is crisscrossed by ancient roads and tracks from near and far. It was an area of great significance for the early development of Aswan – and for encounters between Nubians and Egyptians. 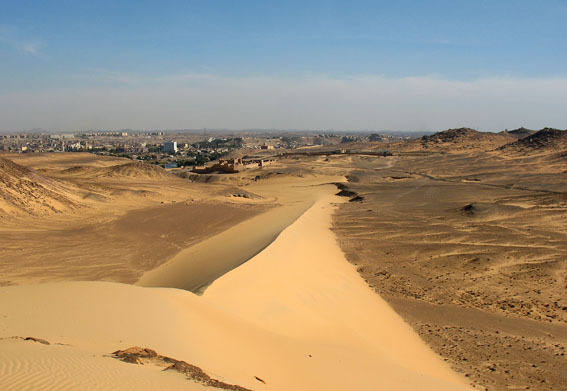 Like in most parts of Egypt, the landscape is heavily threatened by modern development. A new city is now built in the north (New Aswan City), roads are constructed, villages are expanding and modern quarries are “eating” up the ancient ones. This underlines the necessity of conservation measures, wich has been a main theme of the archaeological missions recently working here. But in this article we will concentrate on the archaeology throughout the history of humankind. 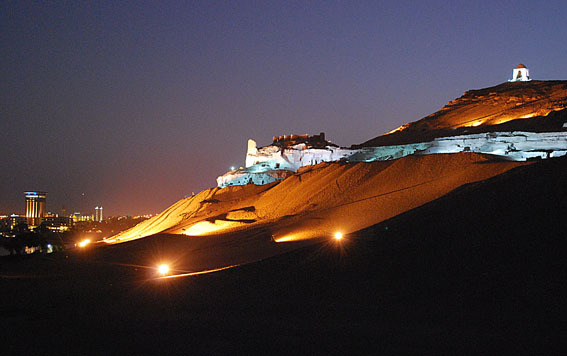 The oldest features set the scene for human presence at Gharb Aswan throughout history. At the highest hills there are several traces of production of Acheulean (Early Palaeolithic) handaxes and cleavers (bifaces). These were crafted from very hard, reddish cobbles and small boulders – the remains of layers and patches of silicified sandstone or “quartzite”. In the Middle Palaeolithic, after c. 150.000 years ago, tool production continued, with numerous quarry and work places on the hills, often at places where also Acheulean artifacts were made. There are flakes and cores, some showing the use of the levallois technology. Very beautiful, black stone with red patches were often used, together with red and yellow varieties. 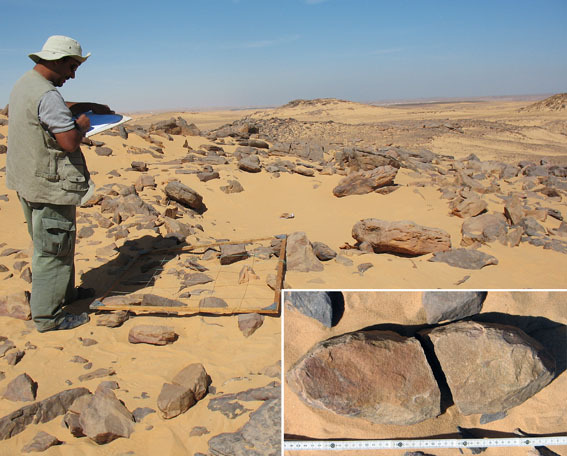 This palaeolithic tool working tradition is not unique in Egypt; there are several other places that show similar workshops, for example in the Second Cataract area. However, it is unique (even globally) that the same stone formed the basis for industries that followed right up to post-Roman times – as we shall see below. 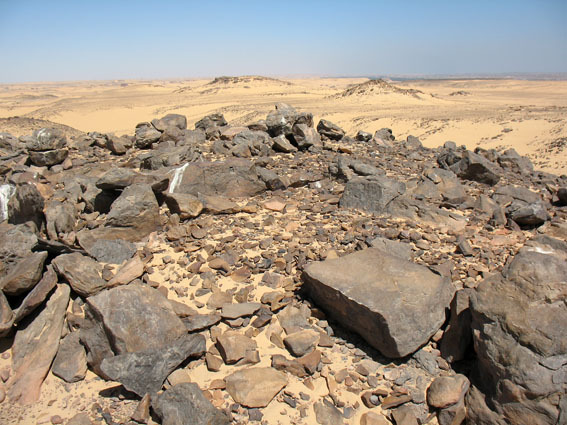 The habitation sites in Wadi Kubbaniya are the highlights of the Late Palaeolithic period. 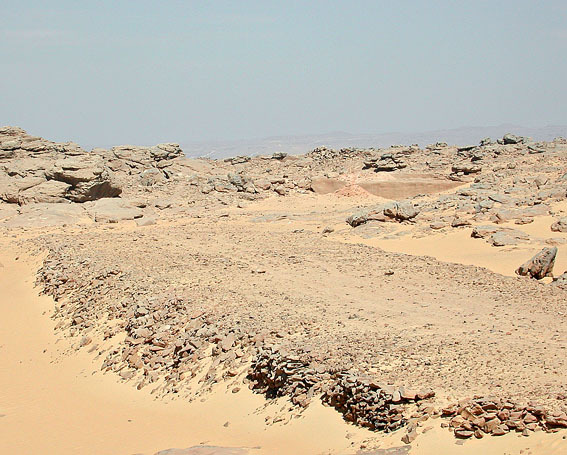 Kubbaniya was an ideal place for habitation at these times, as the Nile flowed 15 m higher than today and a sanddune blocked the mouth of the wadi, implying that a seasonal lake formed behind. This gave resourses necessary to survive in the hyperarid climate. Excavated by the Combined Prehistoric Expedition 30-40 years ago, the most numerous sites are a little less than 20.000 years old. They are famous as bearing evidence of the earliest “agriculture”, in the form of very systematic collection and storing of wild plants. 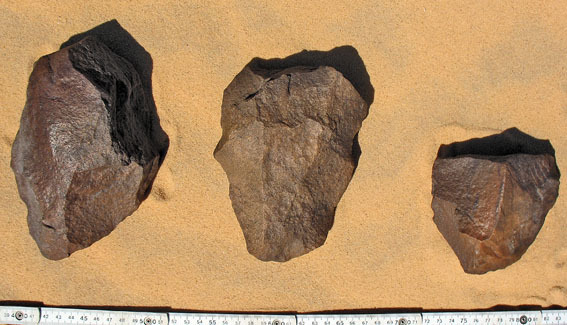 For the processing of such plants (especially tubers), large amounts of grinding stones were needed – made from locally available silicified sandstone. At the end of the Late Palaeolithic period, exceptionally high Nile floods marked the transition from a hyperarid to a wetter Holocene climate. No habitation sites are yet published from the following period, the Epipalaeolithic, but human presence is attested by many rock art sites. 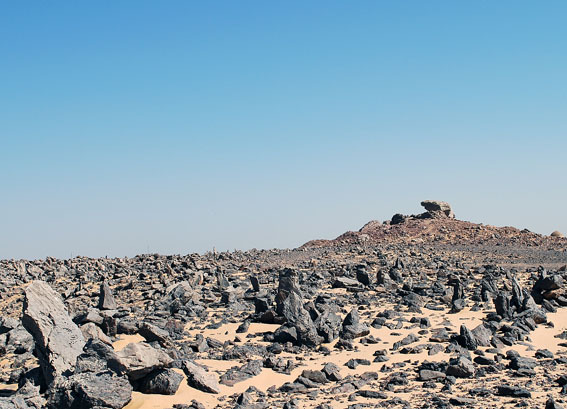 Mainly displaying geometric designs, these sites are part of a rock art tradition of highly mobile peoples that once roamed the more fertile Western and Eastern deserts and at times congregated by the Nile, perhaps for hunting, fishing and stone working. 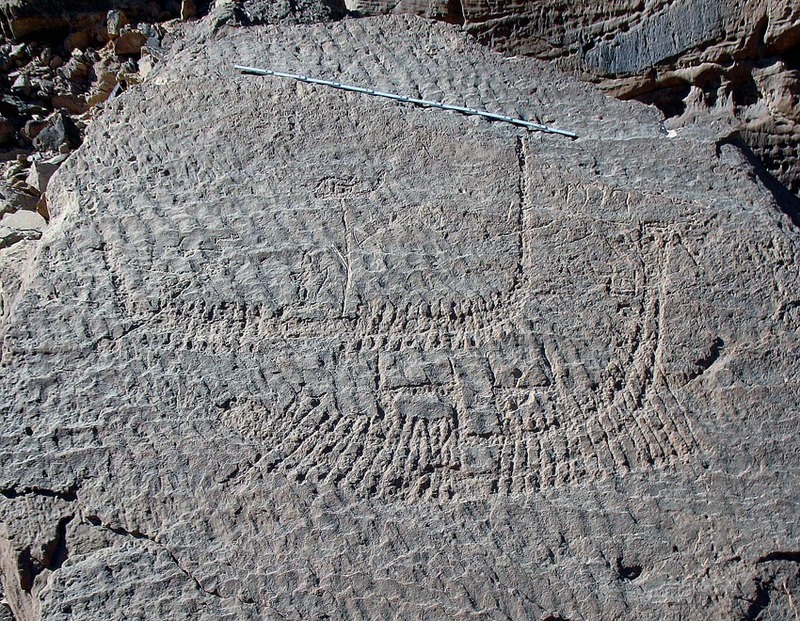 As the climate once more became drier, peoples moving from the desert to the Nile continued to make rock art at Gharb Aswan – and slowly settled along the banks of the river. But the only habitation site yet known is the one recently discovered by the Aswan-Kom Ombo Archaeological Project at Naq el-Qarmila close to the mouth of Wadi Kubbaniya. This dates to slightly after 4.000 BC, the beginning of the Predynastic period. From this period there is also a well-known cemetery at Sheikh Mohammed, close to the river by Gebel Qurna. It was excavated by Hermann Junker in the early 20th century. The later, exceptionally important grinding stone industry seems to have its immediate precursors in the Predynastic period. Such grinding stone quarries took advantage of small boulders of silicified sandstone and were worked to boat-shaped forms. Towards the end of the Predynastic period the Aswan area became increasingly important as a border region between soon-to-be united Upper and Lower Egypt, and Nubia. The important settlement at Elephantine was established in the Predynastic period and at Gharb Aswan the beginnings of the Egyptian kingdom features an exceptionally important rock art site: At Nag el-Hamdulab images of boats with prisoners, animals and the earliest representation of a pharaoh depict “the moment that the religious procession of Predynastic Egypt became the triumphant tour of a tax-collecting monarch” (Hendrickx, Darnell & Gatto). 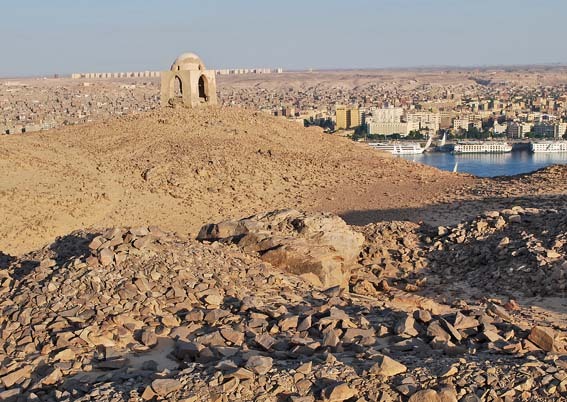 Old and Middle Kingdom – Except from the “Tombs of the Nobles” at Qubbet el-Hawa and several other cemeteries, the Old and Middle Kingdoms are poorly represented by datable archaeological sites at Gharb Aswan. However, it is very likely that the grinding stone industry was rapidly growing in these periods and aimed at export to other parts of Egypt. The grinding stone quarries cover a vast area of nearly 50 square kilometres between the Old Aswan Dam and Wadi Kubbaniya. New Kingdom – Especially in the New Kingdom the grinding stone industry was supplemented with quarrying of obelisks and sculpture for royal purposes. Like in the granite quarries just across the river at Aswan, there are dozens of half-finished objects still lying in the quarries at Gebel Gulab and Gebel Tingar. But the highlight is the very complex network of paved and cleared roads used to transport stone from the quarries to the Nile for shipping. The network spans 20 km and is the best preserved of its kind in Egypt. 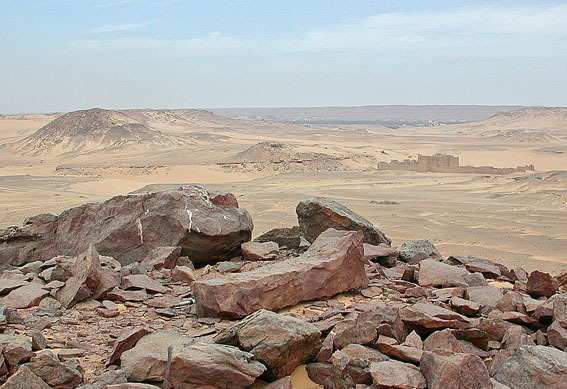 Through the Graeco-Roman period quarrying continued, many cemeteries were established and a Ptolemaic temple (now a ruin) was built by Sheikh Mohammed. 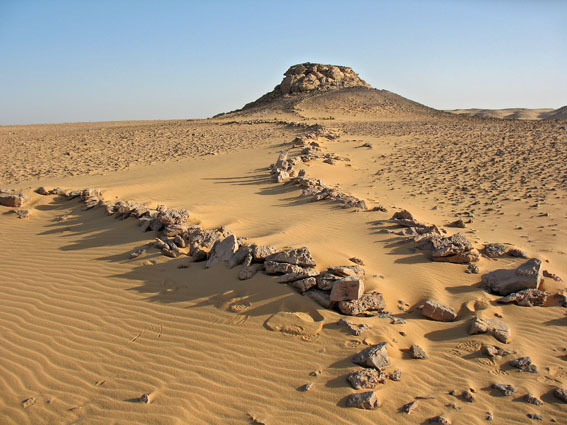 The largest “monument” from this period is, however, the wide, cleared road to Nubia. This road starts by Qubbet el-Hawa and winds its way into the desert to avoid the difficult terrain by the first cataract. It was part of the vast Roman road network in antiquity. The Byzantine period saw the establishment of three Coptic monasteries, of which St. Simeon’s is the most famous. 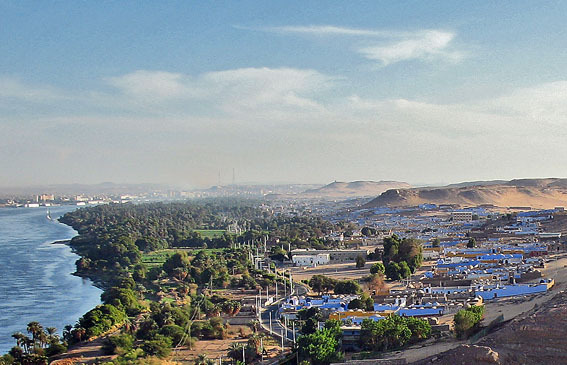 The others are located at Qubbet el-Hawa and Sheik Mohammed. Over the last 1500 years, Gharb Aswan remained an important station for camel caravans heading to Nubia and the Western Desert. Many camel tracks are testemonies of the great significance of trade in this border region. Desert travel was always important at Gharb Aswan. On embarking or returning travellers followed the tradition of raising stones to honour the gods. Over the millennia huge fields of upright stones were thus formed, the largest of which can be enjoyed by the sanctuary at Gebel Tingar. 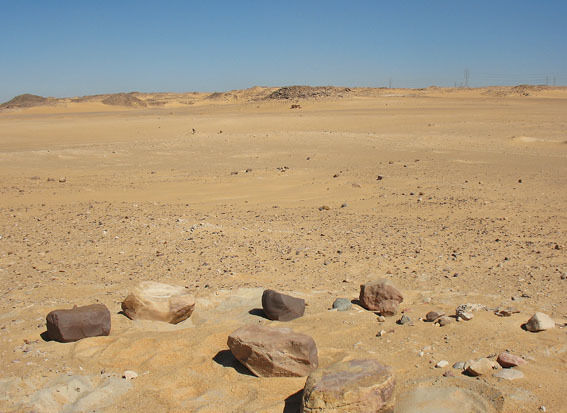 This sanctuary has a very long history and served both travellers and quarrymen in the Pharaonic period. There are many other stone structures at Gharb Aswan. But the most impressive are the stone-built game drives. These were constructed to lead gazelles to specific places in the terrain, so that they could easily be captured. Over time, more than 20 km of stone fences were built – the largest concentration of game drives known in Egypt and Nubia. The tradition is more than 3500 years old, probably much older. In addition, there are hundreds of stone circles, shelters, cairns and other stone structures. And in the Graeco-Roman period many building stone quarries in soft sandstone were opened. The landscape is still in use for traditional purposes: artisan stone extraction for building houses in the villages is going on, and there are several sacred places for various ceremonies, for example at the saint’s shrine by the sanctuary at Gebel Tingar. 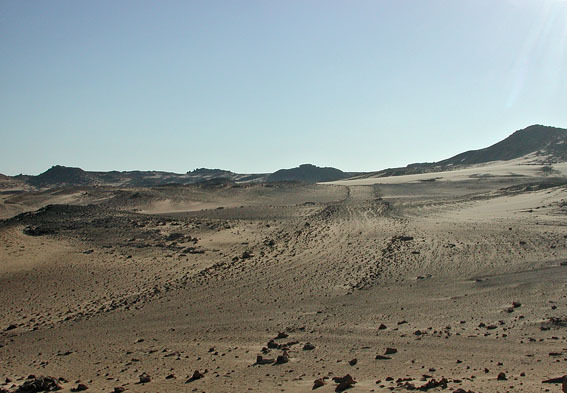 In conclusion, there are few – if any – relatively well-preserved landscapes left in Egypt, which can offer such an extensive range of non-monumental archaeology. Keeping eyes open, at Gharb Aswan we can follow human interaction with the landscape for millennia, almost throughout the history of humankind. This story is an updated version of an article that was published on my website in October 2010. Villages, landscape, QuarryScapes fieldwork & fieldschools, modern development, tours on camel back… Scroll down to find bibliography, mission information and maps. 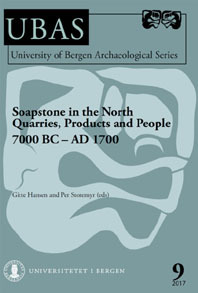 Storemyr, P., Bloxam, E., Heldal, T. and Kelany, A. in press. Ancient desert and quarry roads on the West Bank of the Nile in the First Cataract Region. In; Riemer, H. and Förster, F. (eds.) Desert Road Archaeology, Cologne. The Gebel Gulab and Gebel Tingar Archaeological and Geological Survey. A British-Norwegian-Egyptian mission headed by Elizabeth Bloxam (University College London) and co-directed by myself. 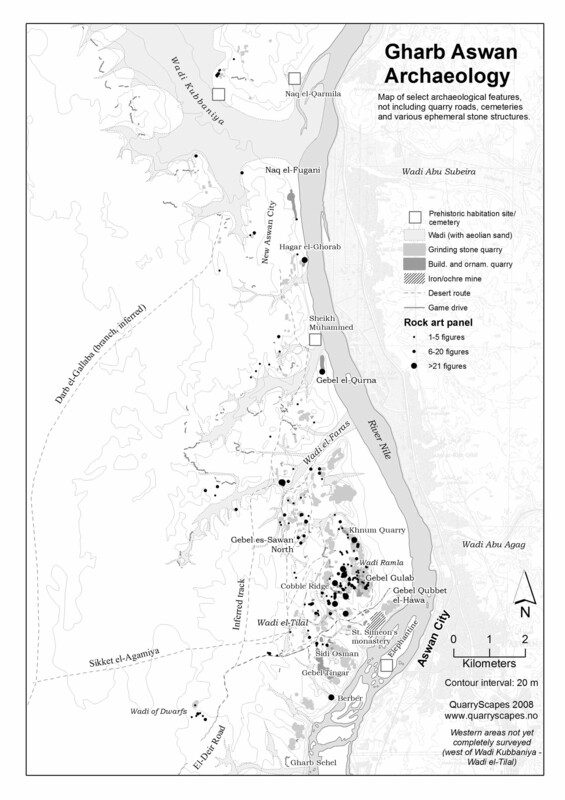 This survey focused on ancient quarries, but also included other archaeological remains. It widened the perspective to conservation, as it was integrated in the EU-funded QuarryScapes project from 2005-2006. The survey area encompassed the whole of Gharb Aswan, from The Old Aswan Dam in the south to Wadi Kubbaniya in the north, but primarily focused on the southern part. The last survey season was in 2008. 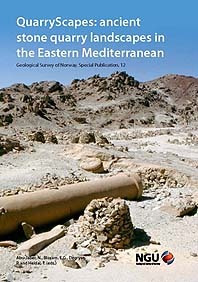 Pharaonic and Graeco-Roman quarries at Gebel Gulab and Gebel Tingar: Around 1980 Rosemarie and Dietrich Klemm surveyed the Pharaonic and Graeco-Roman silicified (or quartzite) quarries in the area between Gebel Gulab and Gebel Tingar (published in “Steine und Steinbrüche im Alten Aegypten” 1993, English edition 2009). 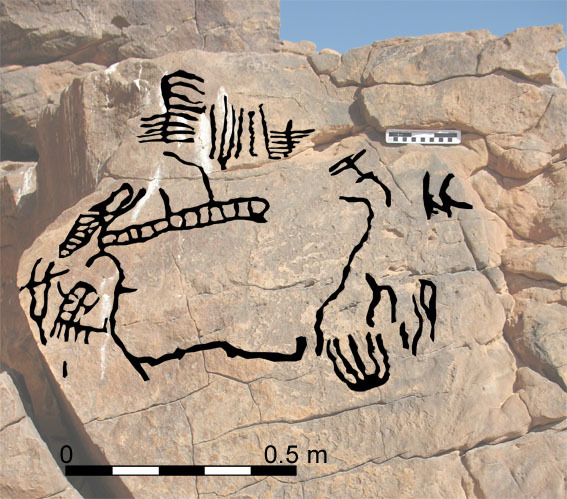 Rock art survey: In the 1930s Hans Alexander Winkler found an important rock art location at Gharb Aswan (site no. 53) during his surveys in Upper Egypt and the adjacent deserts. The location was published in 1938. “The Nubian Highway”: Arthur Weigall’s amusing book “Travels in the Upper Egyptian Deserts” includes an entertaining chapter on the desert roads leaving from Gharb Aswan (“A Nubian Highway” from 1913, re-published in 2005), but was not based on detailed survey. A starting point of the roads, the sanctuary at Gebel Tingar, has been investigated several times since then, e.g. by Horst Jaritz and Stephan Seidlmayer. Excavations by Hermann Junker: Junker excavated two multiperiod cemeteries, one reaching back to the Predynastic period, in the area by Gebel Qurna/Sheikh Mohammed in 1910-11. He also excavated a Coptic monastery built on a Ptolemaic temple in the same area (see free report of the latter excavation here). 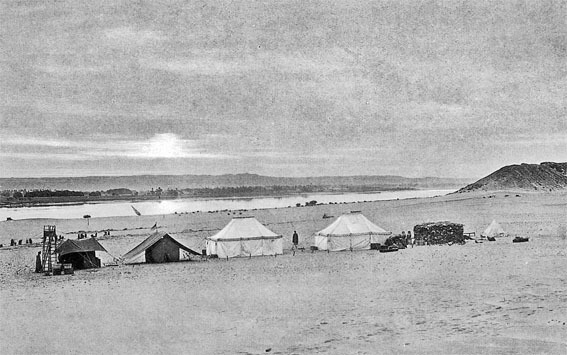 Survey in the 1890s: One of the earliest investigation was carried out as part of J. de Morgan and his collaborator’s survey of the area between Kom Ombo and Aswan, published in 1894. This entry was posted in Ancient Egypt, Archaeology, Old quarries, Rock art and tagged Ancient Egypt, Gharb Aswan, hunting, quarry, rock art. Bookmark the permalink. 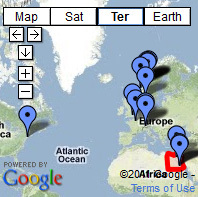 Thankyou – most interesting, and the references are great! Similar wildlife ‘runs’ exist in southern africa, which you probably know. I see my old friend, Adel Kelany, in the picture of the grinding-stone quarry.